Things change quickly in our world, so the published contacts in the back of the above book changed from the time we went to press, to the time when it was released. So the contacts below are our best attempt to try and get the latest updates on the contributors to this book. "Understanding Your Life Through Color"
"Understanding your life Through Awareness"! 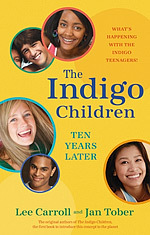 "Indigo" color for these children of new consciousness. Jennefer M. Townsley, Ed D.
Pat Childers, M.S in Ed. Bruce I. Doyle, III, Ph.D.
Becky Engler Hicks, Ph. D.
Book resource information is out of date. Anybody know where he is?